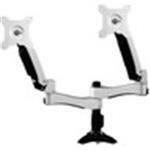 The amr2ap is a dual interactive lcd arm stand that provides users comfortable viewing angles. it has an aluminum structure with an easy cable management design. the simple grommet base feature allows for a less cluttered and larger workspace.